What Style is my Bungalow? Back by popular demand: From tiny to Titanic and from vintage to new, AB brings you an assortment of kitchens from some of your favorite featured homes. Roses and tulips abound in this lovely home in Toledo’s Historic Old West End. With records long gone, the author attempts to discover the history of his European-influenced home, as well as its architect. One man, eighty tribes, three decades: the story behind the iconic Native American photographs that have adorned countless Arts and Crafts homes. Sensible, practical and snug, the humble bungalow has always been the very definition of sustainability—generations before most of us had ever heard the word. THE BUNGALOW CHARM OF LEXINGTON, KY.
From horse farms to family homes, bungalow style is a perfect match to Lexington’s longstanding air of Southern hospitality. Recreating grandmother’s garden isn’t quite as simple as it seems. The author defines what “heirloom” means to passionate gardeners while offering sage advice for gardening success. A reader shares a vintage bungalow publication, readers swap resources for hard-to-heat homes, and a request for Arts and Crafts lodgings in New England leads a reader to our new website. From coast to coast, readers share their pride in their bungalows. In a special column, David addresses the all-too-prevalent problem of fakes and frauds in the world of collecting. A selection of Arts and Crafts–inspired amenities for today’s bungalow lifestyle. Forty years ago, Rick Badgley of RB Woodworking turned his back on Wall Street and headed for the mountains to craft Stickley reproductions in an underground woodshop—and he’s never regretted it for a second. 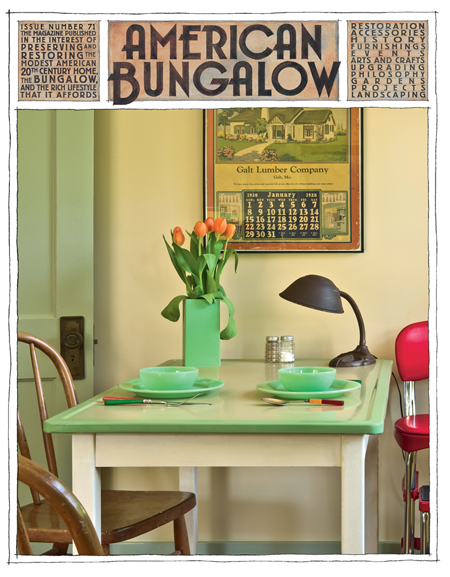 American Bungalow Magazine Online – Your source for bungalow and arts & crafts news. April 22nd: Online sale coming this week!